Amazon DTH Recharge Offer / Amazon DTH Cashback Offer - Now you can Recharge your Airtel, Dish TV, Videocon, Sun Direct, Reliance Digital TV DTH at Amazon. You can get 10% Cashback upto Rs.50 as Amazon Pay Balance . on Other hand you will get 20% cashback upto Rs.100 on TataSky recharge. Rs.300 minimum recharge amount / value required to avail the offer. The cashback (under this Offer) will be given within 3 days of the DTH Recharge in your Amazon wallet/pay balance. This offer is applicable on DTH recharges for all operators across India. Offer valid till 31st August. Select the relevant operator and amount of your choice. How to do Amazon DTH Recharge? How to Recharge DTH with Amazon Pay Balance? : Amazon Pay se DTH kaise Recharge Kare? Now Choose Payment mode as “Amazon Pay Balance” Only. Having an Amazon account is a bliss. With the Amazon Pay balance facility, you could easily do your DTH recharges. Whether you are a Tata Sky user or have Airtel Digital TV connection, to do your monthly or yearly recharges, simply visit the Amazon Pay account to make payments. Along with the swift facility, you would get amazing Amazon DTH recharge offers that you can use to earn cashback and discounts. On using Amazon Pay balance to recharge DTH connections, users can avail an exciting cashback of 20% up to Rs. 40. The offer is valid for once per customers. Amazon DTH recharge offer is valid only when a user does a DTH recharge on Amazon.in. Users can avail a cashback of 20% maximum up to Rs. 40. The offer is valid for all DTH service providers. No DTH recharge promo code is required. The validity of the offer is till November 30th, 2018. The cashback amount will get credited to the user's account within three days from the date of recharge. Users cannot combine any other offers or schemes running on the Amazon platform with the current offer. The cashback will be credited to the user's Amazon Pay balance in the form of Amazon Gift Card. The offer is applicable solely for DTH connections and not in respect of prepaid mobile recharges or postpaid mobile bill payments or payments or recharges of utility bills. The eligible users will receive the relevant cashback amount on the successful DTH recharge transaction made on Amazon platform during the offer period. The cashback amount will be auto-credited to the user's account within three days from the time of recharge. In case, a user fails to follow the specific terms and conditions, he/she will no longer receive the cashback amount mentioned under this offer. Amazon reserves the right to alter/add/change/modify the terms and conditions of Amazon DTH recharge offer at any time without giving any prior notice or specific reason whatsoever. Amazon holds the right to disqualify a customer from taking the benefits of the offer at any time, in case of any fraudulent or suspicious activity. Participation in the Amazon DTH recharge offer is completely voluntary. Amazon shall not be held responsible for any damage or loss that a user may suffer in connection with the offer, directly or indirectly. 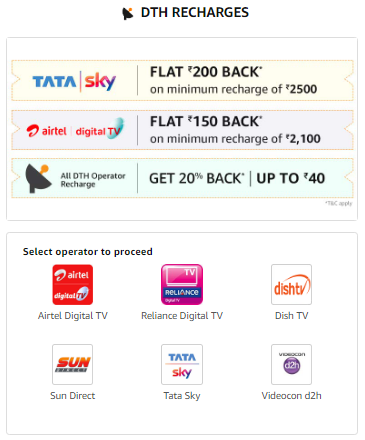 If you wish to save a few bucks on your TATA Sky connection recharges, make use of the Amazon TATA Sky recharge offer that allows you to earn amazing cashback of Rs. 200. The maximum cashback amount that you can earn is Rs. 200. To avail the Amazon TATA Sky recharge offer, users have to recharge their TATA Sky connection using Amazon.in. The minimum transaction amount to avail the offer is Rs. 2500. Using the offer, users can earn cashback maximum up to Rs. 200. The offer is valid for one time per customer during the period offer. The total cashback that a user can avail is Rs. 200, during the offer period. The cashback will get credited to the user's account as Amazon Pay balance within three days from the time of the recharge. Users cannot combine the Amazon TATA Sky Recharge offer with any other offer running on Amazon.in. To avail the offer, users can pay using their Amazon wallet on Amazon website/ mobile site/ mobile application. The Amazon TATA Sky offer stands void in case of cancellation for any reason whatsoever either by the customer or Amazon or the DTH provider. The mentioned cashback will get credited to the user's account within three days from the time of the successful DTH recharge. Amazon reserves the right to alter/add/change/modify the terms and conditions of Amazon TATA Sky recharge offer at any time without giving any prior notice or specific reason whatsoever. Participation in the Amazon TATA Sky recharge offer is completely voluntary. Amazon shall not be held responsible for any damage or loss that a user may suffer in connection with the offer, directly or indirectly. In case you are an Airtel Digital TV users, you can directly avail a flat cashback of Rs.150 on using Amazon Pay balance to recharge your connection. The minimum transaction amount to avail the Amazon Airtel Digital TV offer is Rs. 2100. With the minimum Amazon Airtel Digital TV recharge, users can avail the cashback of Rs. 150 after using Amazon Pay balance as the payment method. A user can avail the offer for one time only during the offer period. The validity of the Amazon Airtel Digital TV recharge offer is till November 30th, 2018. The offer is applicable solely for Airtel Digital TV connection and not in respect of prepaid mobile recharges or postpaid mobile bill payments or payments or recharges of utility bills. The eligible users will receive the relevant cashback amount on the successful Airtel Digital TV recharge transaction made on Amazon platform during the offer period. The Amazon Airtel Digital TV recharge offer stands void in case of cancellation for any reason whatsoever either by the customer or Amazon or the DTH provider. Amazon reserves the right to alter/add/change/modify the terms and conditions of Amazon Airtel Digital TV recharge offer at any time without giving any prior notice or specific reason whatsoever. Participation in the Amazon Airtel Digital TV recharge offer is completely voluntary. Amazon shall not be held responsible for any damage or loss that a user may suffer in connection with the offer, directly or indirectly.